The digital transformation wave has begun to wash over the financial services industry, but what does this transition actually mean for firms trying to stay ahead of the competition? In a nutshell, it means companies should prepare for disruption, as going digital isn’t just about rolling out a few new customer-facing mobile apps. 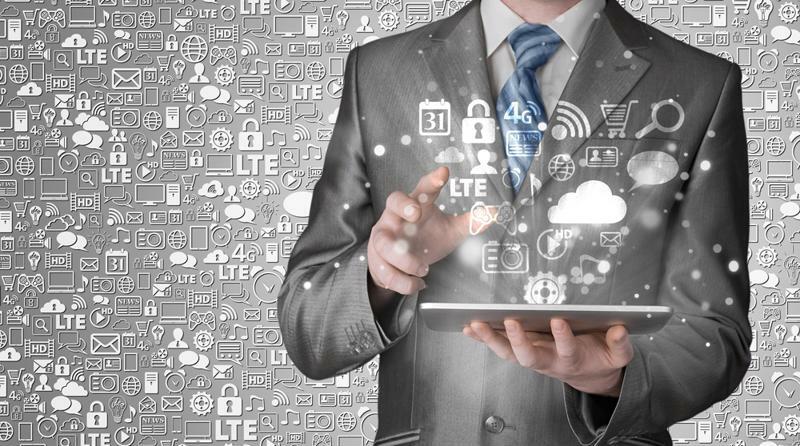 A digital ecosystem demands innovation that touches internal and external stakeholders alike. A Deloitte survey found that 93 percent of financial services firms either agree or strongly agree that their digital transformation efforts are aimed at improving customer experiences and engagement levels. Furthermore, 90 percent agree or strongly agree that digital technologies are having a disruptive impact on the industry. While there is a clear consensus that digital transformation is happening and is important, there is less clarity about what is actually working. Of those polled by Deloitte, just 46 percent believe their organizations are preparing for digital transformation to an adequate degree. So where is the divide? Why is there a clear move to prioritize digital transformation, but an evident failure to actually execute on that desire? Deloitte found that the problem resides with an excessive focus on customer experiences. While the customer journey is critical within the digital financial services landscape, supporting a quality customer experience is only possible if workers are adequately equipped to keep up with consumer digital lifestyles. The survey found that most employees aren’t. Just 36 percent of those polled by Deloitte believe their organizations are handling employee skills development and resource management adequately in light of the need for digital transformation. Furthermore, 41 percent of respondents plan to stay with their current employers for three or more years. Employees aren’t getting the digital solutions they need to keep up with transformation, and they want to work for companies that will equip them as necessary – 76 percent of respondents said it is “very” or “extremely” important to work for digitally-enabled organizations. 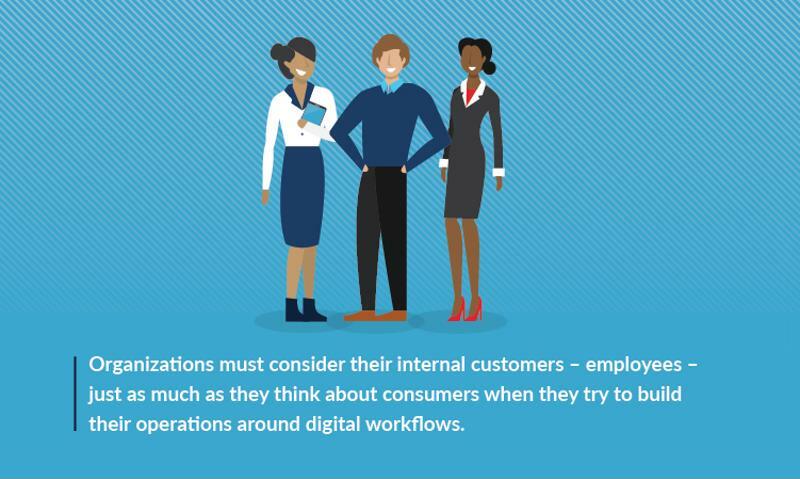 All of these findings point to a key conclusion for digital transformation success: Organizations must consider their internal customers – employees – just as much as they think about consumers when they try to build their operations around digital workflows. The urgency surrounding this move is becoming acute, as Forbes reported that technological innovation has created an operational climate in which fewer financial services customers are engaging with banks or credit unions in person. Instead, many users are focusing almost exclusively on digital services. Employees must be equipped to support these customers by working at the pace created by digital service models. Deriving a return on investment from employee-focused technology is possible when businesses are able to use data, applications and infrastructure to empower workers to meet customer demands. Consider traditional investment banking workflows. They are mired in paper as project stakeholders go back and forth pulling data, gathering records and connecting with partners to try and get a clear idea of what is happening at any time. When digital data is available, it is often just as siloed as the paper-based systems of yore, forcing employees to hop between email messages, social media conversations and phone calls to get the data they need to make better decisions. In financial services, making good choices on behalf of clients and justifying those decisions to engage and satisfy customers is critical. Finding ways to bridge longstanding silos and make data widely accessible to authorized users is critical in digital transformation. Employee experiences are directly related to customer journeys. This need for better data visibility underpins the importance of employee empowerment in the digital world. To see this strategy in action, consider the efforts of the Target Group UK, which worked with Appian to modernize its processes and capabilities to fuel digital transformation. To manage such a robust operational environment, the firm focuses on value creation by transforming customer journeys and experiences across a platform-based service model. The complexity and scale of its operations make it a prime example of the need for digital transformation. Because digital disruption is emerging as a critical trend in the sector, the Target Group UK recognized that automation is essential. The firm came to Appian to establish the backend process management and application development capabilities needed to automate complex processes and workflows. This aggressive approach was necessary, in part, because the Target Group UK works with a wide range of customers, including two of the largest retail banks in the UK, the challenger bank community, with startups and with investment funds and houses. These capabilities came together to let the Target Group UK interconnect all of the channels of data and information being delivered by customers, empowering workers to make the decisions that are right for their clients. Digital transformation is increasingly necessary in the financial services sector. The Target Group UK stands as an example of how building better processes and capabilities for employees can extend out to customers. Digital transformation programs can be left stuck in neutral if they focus only on external users. Such an effort will leave workers unable to adjust to new customer demands. Empowering the workforce to support digital customers, on the other hand, provides a holistic and sustainable operational climate that can drive engagement. To learn more about how the Target Group UK made this happen, check out their customer story.